PayConcierge gives your customers the ability to enroll in AutoPay electronically to setup single or future/recurring payments. The easy to use payment system helps you capture more payments and increase customer loyalty. With email reminders generated by PayConcierge, your payers will feel much more comfortable scheduling payments and enrolling in AutoPay when they receive these reminders prior to the payment date. Additionally, email reminders will cut down the number of ACH Rejects from overdrafts and significantly increase use of the feature going forward. 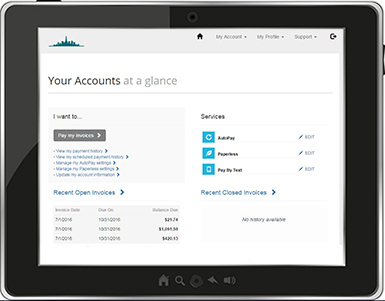 Customers have a variety of self-service features including AutoPay, Scheduling Payments, Recurring Scheduled Payments, Account Linking, Paperless billing, and Pay-by-Text.